Frank Glazer, Maine’s best-known pianist, marks the 70th anniversary of his New York City debut with a performance of that 1936 program at 7:30 p.m. Friday, Oct. 20, in Bates College’s Olin Arts Center Concert Hall, 75 Russell St. The concert is open to the public at no cost. For more information, please call 207-786-6135. In a era whose pianists often strive for the gloss of mechanical precision and big sound, the 91-year-old Glazer instead makes all else secondary to the music’s own message. “He has thought everything through and tried to get at the core of what the music is about. Everything he does is about that,” says colleague James Parakilas, a pianist himself and the James L. Moody Jr. Family Professor of Performing Arts at Bates. Glazer was 21 when he made his New York debut at Town Hall on Oct. 20, 1936. At Bates he will repeat the Town Hall program: Johann Sebastian Bach’s “English” Suite No. 3 in G minor, Johannes Brahms’ Sonata No. 3 in F minor (Op. 5), Franz Schubert’s Sonata in A minor (D. 845), and four works by Frederic Chopin — the Ballade in A-flat major (Op. 47), the mazurkas in A minor (Op. 17, No. 4) and in D major (Op. 33, No. 2) and the Scherzo in C-sharp minor (Op. 39). Glazer, of Topsham, has been a resident artist at Bates since 1980. He is a musician of international stature whose long career includes numerous recordings and premieres of contemporary music, his own television program in the 1950s and countless solo recitals and performances with orchestras and chamber ensembles, including the New England Piano Quartette, of which he was a founder. He taught at the Eastman School of Music for 15 years before coming to Maine with his wife, Ruth, in 1980. The couple founded the Saco River Festival, held in Cornish every summer. In the 1930s Glazer studied with both Artur Schnabel, a leading interpreter of the Viennese masters, and with Arnold Schoenberg, whose atonal compositions were the antithesis of Viennese lyricism. The 1936 debut came about thanks to one Alfred Strelsin, a New York signage manufacturer and arts patron. He was a Glazer loyalist who helped send the pianist from his hometown, Milwaukee, to study in Berlin with Schnabel in 1932. 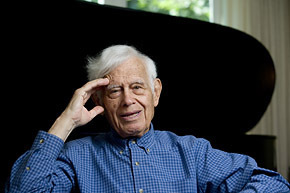 But the performance was a triumph, and marked the start of a performing career that hit its full stride after Glazer’s World War II military service and his development of a piano technique that has enabled this artist to remain creatively robust into his 90s.